Mundelein, the "Skyscraper College" (undated). Earlier this month, I had the opportunity to head back to Chicago for a long weekend of Catholic history. The conference I attended, Crossings and Dwellings: Restored Jesuits, Women Religious, Amercan Experience, 1814-2014, was held in conjunction with the closing weekend of the exhibition of the same name at Loyola University Chicago. In between conference panels, I ducked into the exhibition galleries, which featured room after room of breathtaking Catholic objects on loan from around the Midwest (I highly recommend the multimedia feature "5 Galleries, 5 Iconic Objects," crafted by Loyola's talented public history students). I was captivated by pieces chosen to illustrate the history of Catholic women's education, including a rare 1860s "Young Ladies Sodality" banner from Holy Family Parish on Chicago's West Side and a portrait of a young Catholic girl that hung for decades on the walls of Jane Addams' Hull House. I was especially excited to see one of the exhibition's galleries devoted to the history of Mundelein College, an unmistakable Art Deco landmark on Chicago's Sheridan Road. While conference co-organizer Kyle Roberts--who has written here about the Jesuit Libraries Project--will recap the "Crossings and Dwellings" weekend in future posts, I wanted to draw attention to an important theme of the weekend: recognizing the contributions of sister-builders. As I draft a syllabus for my Spring 2015 course on women's higher education history at Bryn Mawr College, I've been thinking about how my students should understand the world of women's education that extended beyond the so-called "Seven Sisters." Why might we still care about Mundelein, which opened in 1930 and merged with Loyola in 1991, or other now-defunct Catholic women's colleges whose missions have been folded into coeducational institutions? 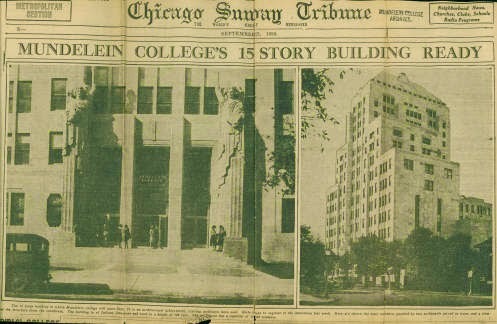 Chicago Sunday Tribune announces the opening of Mundelein College, September 1930. Women and Leadership Archives, Loyola University Chicago. Perhaps the most visible “tower” in the world of Catholic women’s education was Mundelein College, a small liberal arts school located on Chicago’s North Side. 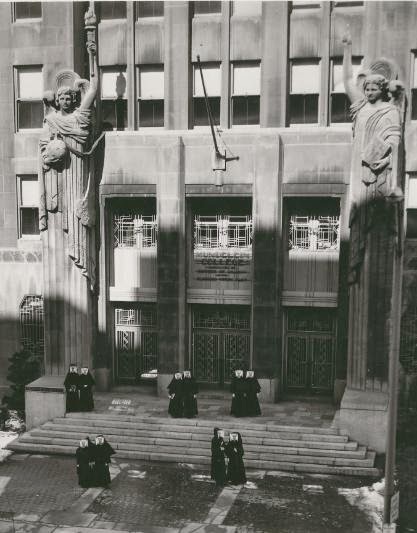 Mundelein’s distinctive art-deco skyscraper building--its front doors flanked by four-story tall stone carvings of the angels Jophiel and Uriel, representing beauty and light--was a bold statement of the founders’ vision of merging innovation with Catholic tradition. 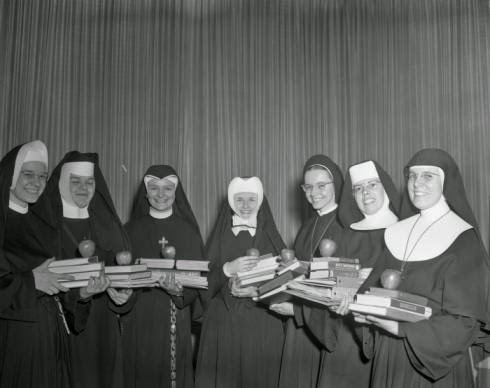 Established by the Sisters of Charity of the Blessed Virgin Mary (popularly referred to as the BVMs) at the urging of Chicago’s Archbishop Mundelein, the College opened in September 1930 with almost 400 students recruited from 69 area high schools. By 1957, Mundelein was the largest Catholic women’s college in the country; it would be the last four-year all-women’s college in Illinois when it merged with Loyola University Chicago in 1991. 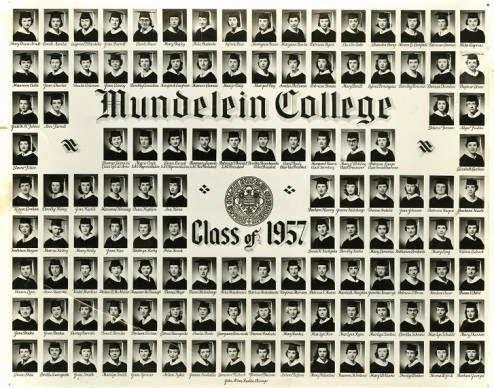 Mundelein College Official Class Photo, 1957. Despite the College's name, these young women's Mundelein experience was shaped by women. We often speak of Catholic sisters' important institutional roles in growing the Church, but during the conference weekend, I appreciated the use of a term I hadn't heard before: sister-builders. "Builder" is a particularly useful way for thinking about the Chicago BVMs, who managed a construction project in the early years of the Great Depression, getting their dream of a "skyscraper college" off the ground in 1929. Their vision for a modern, Art Deco high-rise is, perhaps, a point that deserves further reflection in conversation with Cushwa's Catherine R. Osborne, who recently shared her work on 20th-century U.S. Catholic architecture on the blog. In addition to the idea of sister-builders, I'd also suggest we haven't talked much about sister students. In her opening address, historian Carol Coburn pointed to the Sister Formation Movement at mid-century, with its mission of better educating sisters for their teaching vocations. "Sister Students," undated. Women and Leadership Archives, Loyola University Chicago. What did it mean for laywomen and sisters to share the classroom, together, as students? I became fascinated by this phenomenon as I browsed the digital collections of Mundelein College online through Loyola's rich Women and Leadership Archives (WLA) and the yearbooks of another "disappeared" women's college, Newton College of the Sacred Heart, which merged with Boston College in 1974 (the subject of a conference paper by historian James O'Toole). The WLA website hosts a timeline of Mundelein College history, which begs comparative work with other Catholic (and not Catholic) women's colleges during the immediate post-war era. As I reflected on these histories in Chicago, I learned that the Conference on the History of Women Religious (CHWR) is beginning to build its social media presence on Twitter and Facebook. The CHWR recently shared an article by Katherine A. Greiner, "A College of One's Own," another call for more attention to women religious in women's higher education. Their histories--as students, as alumnae, as teachers, as administrators--are numerous and ripe for further research. Scheir and Russett, eds., Catholic Women's Colleges in America (Baltimore: Johns Hopkins University Press, 2002), 27. Sister Mary Alice Joseph Moore, “Catholic College Student Retention in the United States” (Ph.D. dissertation, Catholic University of America, 1957), 127. Reverend Chas. A. Hart, “Catholic Action and the Catholic College,” Catholic Action 28.8 (August 1946): 7. For similar praise, see Roy J. Deferrari, “The Challenge to Catholic Colleges and Their Graduates,” Journal of Religious Instruction 17 (October 1946): 162-71. Mundelein attracted a handful of resident students; they were housed in Mundelein’s skyscraper building and other nearby spaces until Coffey Hall, a dedicated student dormitory, opened in April 1963. See Sister Joan Frances Crowley, “Remembering 1962-1969,” in Ann M. Harrington and Prudence Moylan, eds., Mundelein Voices: The Women’s College Experience, 1930-1991 (Chicago: Loyola University Press, 2001), 154-55. Thanks for this very interesting post as well as the conference summary. I attended Mundelein College (Class of 1968) and, to answer one of your questions, going to classes with our contemporaries who had entered the religious life didn't seem strange to us; we were or became friends and later exchanged visits when they received teaching assignments. Some had been our classmates in high school, but they were a year "behind" because they had been in Los Gatos or Dubuque during the time that we were first-year college students. And, like almost all of us, they were first-generation college attendees. It's worth noting that of Mundelein's legacies was that it trained teachers for Chicago's public and parochial schools. Of course, during my 4 years there, the women religious (both faculty and students) were throwing off their habits and so the visible differences between us diminished considerably. It might have been different during the 1950s. Best of luck with your spring course. Anne, many thanks for your comment. I do find it fascinating to see how the representation of women religious shift in the yearbooks from these institutions over the course of the 1960s; with so much attention to that tumultuous decade I've also become increasingly interested in campus life during the immediate postwar. It was a fantastic conference with many Mundelein alumnae in attendance! I, too, appreciate this summary of what I found to be a fascinating conference. I attended as the daughter of a Mundelein graduate and the granddaughter of a St. Mary's High School student. My mother had a ceramic tile in our home which mentioned something about Mundelein being the only skyscraper college for women. We paid scant notice, but it wasn't until I heard Ellen Skerrett speak about "Sister-Builders" in a talk in October in conjunction with the exhibition that I truly understood how extraordinary that skyscraper and those Sisters were. The contributions of Dr. Rima Lunin Schultz connected the neighborhoods of Hull House, Holy Family Parish, and St. Mary's High School and wove my family's personal history up to the lake shore campus of Mundelein through these same Sister-Builders. Some of the beautiful art deco artifacts in the exhibit got my mother's friends and fellow classmates from Mundelein reflecting upon rooms, furnishings, and discussions from their college days in ways they hadn't thought about in years--successfully making history come alive for them and their descendants. Glad to hear you are exploring different facets of sister-builders in this century.